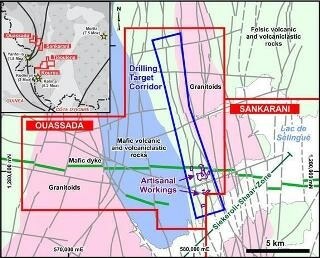 Recently, Compass Gold Corp. has provided an update on the present geochemistry and geophysics surveys, and the scheduled Q4 work program on the Sikasso Property in Southern Mali. This represents an exciting new chapter for the Company, as it will be the first bedrock drilling program ever executed on our 1,179 sq. km Sikasso property. We’ve achieved this pending milestone through the dedicated work of our technical team, led by Dr. Madani Diallo, which has complied the results of extensive exploration geochemistry and geophysics work to identify these first 14 bedrock drilling targets. While we had already planned and budgeted to examine the first two targets in this second phase, we have identified still more priority targets. Now, with the additional funds raised in May, we are looking to expand our bedrock drilling to test four priority target zones in areas of current artisanal mining activity. We hope that drilling will begin in early-November when ground conditions are suitable. A comprehensive review has been performed on the exploration results Compass has received thus far to establish suitable locations for bedrock drilling. The data reviewed comprised shallow soil geochemistry; remote sensing structural analysis; interpretation of a recently completed induced polarization (IP) study; deep auger soil geochemistry (to depths of 22 m); reinterpretation of high-resolution airborne magnetics, electro-magnetics (EM), and radiometric surveys; and geological mapping. Nearly 12,000 m of drilling has been identified, with 3,500 m (35 drill holes) considered to be high-priority because of the nearness of these targets with identified artisanal gold operations. The artisanal workings encompass a strike length of 4 km. Primarily this work will be achieved by air core (AC) and reverse circulation (RC) drilling. It is expected that more diamond drilling methods will be necessary to provide extra geological information. Assay results from a total of 103 deep auger soil samples are still anticipated from the Ouassada permit. These results are from target area 2 (TA2), which is centered on the contact between the western granitoids and the central mafic volcanic and volcaniclastic rocks. These results will be announced shortly. As stated in the press release dated July 16, 2018, an expedited deep auger drilling program has also been finished over the Sodala and Tarabala shallow soil gold anomalies on the Sankarani permit. The samples have been transported to SGS (Bamako) for examination. The results are awaited. In May and June 2018, approximately 7,500 shallow soil samples were collected over the highly prospective areas within the Kalé, Kourou, and Tiélouléna permits. These samples are presently at the ALS assay laboratory in Johannesburg, RSA, and will be announced after the assays have been certified. The results of all of the available exploration done on the Ouassada permit were used to identify 14 bedrock drilling targets. These targets are all found in a felsic volcaniclastic unit that has several highly-anomalous gold in soil samples, and also comprise two large artisanal gold workings. Compass’s technical team has put together a 12,000 m drilling program with up to 120 drill holes, and it is estimated that drilling, which will be funded from the Company’s current treasury, will start at the end of the rainy season. In the meantime, assay results from shallow soil samples taken from Kalé, Kourou, and Tiélouléna are anticipated, as are results from deep soil auger drilling from Sankarani.